BERKELEY - Perhaps more than any other individual, architect John Galen Howard shaped the face of the U.C. Berkeley campus. In a new book from UC Press, "John Galen Howard and the University of California: The Design of a Great Public University Campus," author Sally B. Woodbridge rolls back the clock to 1890s, when the Regents sought ways to improve the University. Bernard Maybeck, then a mechanical drawing instructor in the Engineering department, proposed an architectural competition. They were looking for a "grand vision" (in Woodbridge’s phrase) to transform the undistinguished campus into a "City of Learning." Maybe, it was felt, legislators and philanthropists would support the University if they could see architectural renderings of the buildings "that would perpetuate their names in stone." "The purpose is to secure a plan to which all the buildings that may be needed by the University in its future growth shall conform. All the buildings that have been constructed up to the present time are to be ignored, and the grounds are to be treated as a blank space to be filled as a single beautiful and harmonious picture as a painter fills in his canvas. "The site of the University of California at Berkeley, California, comprises 245 acres of land, rising at first in a gentle and then in a bolder slope from a height of about 200 feet above the sea level to one of over 900 ... It is thought that the advantages of the site, whose bold slope will enable the entire mass of buildings to be taken in at a single coup d’oeil, will permit that production of an effect unique in the world, and that the architect who can seize the opportunity it offers will immortalize himself. "It is seldom in any age that an artist has had a chance to express his thought so freely, on so large a scale, and with such entire exemption from the influence of discordant surroundings. Here there will be at least 28 buildings, all mutually related and, at the same time, entirely cut off from anything that could mar the effect of the picture. In fact, it is a city that is to be created — a City of Learning — in which there is to be no sordid or inharmonious feature. There are to be no definite limitations of cost, materials, or style. All is to be left to the unfettered discretion of the designer. He is asked to record his conception of an ideal home for a University, assuming time and resources to be unlimited. He is to plan for centuries to come. There will doubtless be developments of science in the future that will impose new duties on the University, and require alterations in the detailed arrangement of its buildings, but it is believed to be possible to secure a comprehensive plan so in harmony with the universal principles of architectural art, that there will be no more necessity of remodelling its broad outlines a thousand years hence than there would be of remodelling the Parthenon, had it come down to us complete and uninjured. "In the great works of antiquity the designer came first, and it was the business of the financier to find the money to carry out his plans. In the new building scheme of the University of California, it is the intention to restore the artist and the art idea to their old pre-eminence. The architect will simply design; others must provide the cost." John Galen Howard did not win the competition. He finished fourth. The winner was Émile Bénard of Paris. Bénard delivered a series of designs but when he traveled to Berkeley, managed to insult virtually everyone he met, and persuaded the Californians that he was not to be entrusted with the execution of any of his work. Too, Bénard could not have executed his designs because he refused to leave Paris for duty in the sticks of Berkeley. Enter John Galen Howard. 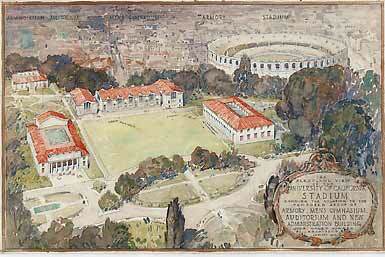 Howard, a New Englander who had attended MIT and the Ecole des Beaux-Arts in Paris, spent a year in Los Angeles before entering the Berkeley architectural competition. Because of his California connections, he was appointed to an advisory council to "oversee the implementation of Bénard's designs." President Benjamin Ide Wheeler subsequently appointed Howard as the supervising architect of the University in 1901. In reviewing the Woodbridge book, Clark Kerr, president emeritus of the University of California, notes that what many have long attributed to Bénard rightfully must be credited to Howard. "I had falsely believed the myth that the original Berkeley campus was the 'Bénard plan' resulting from the Phoebe Apperson Hearst competition of 1899. Sally Woodbridge shows me how wrong I was. The actual plan was that of John Galen Howard. He was hired to carry out the Bénard plan but thought it to be 'utterly impractical.' So he went to work in his more practical way as the campus of today so well demonstrates." Howard developed a style of architecture that was inspired by stately classical lines. Among the campus landmarks built during his tenure were the Hearst Memorial Mining Building (1902-7), the Hearst Greek Theatre (1903), California Hall (1905), Doe Library (1911-17), the Campanile (1914), Wheeler Hall (1917), Gilman Hall (1917), and Hilgard Hall (1918). This ensemble of buildings helped transform what had been a pedestrian institution into a true "City of Learning," the UC Berkeley campus of today. In addition to the story of the Hearst competition and its unexpected outcome, author Woodbridge provides an account of Howard's 25-year career in architectural education as the founder and head of the University of California's School of Architecture. Her book fills in the social context of Howard's work and the character of the campus community during the first quarter of the twentieth century. Wrote Sunset magazine senior editor Daniel P. Gregory, "This book fills a large gap in the design history of Northern California by deftly and vividly tracing the life and career of classically trained architect John Galen Howard, who, more than any other individual, helped shape the early twentieth-century character of the U.C. Berkeley campus. It's a story of Beaux-Arts artistry meeting Bay Area informality to produce an early expression of environmental design." Among Sally B. Woodbridge's books are Bernard Maybeck: Visionary Architect (1992), San Francisco Architecture (1992), Details: The Architect's Art (1991), and Bay Area Houses (1988). In 1993 Woodbridge received national honors from the American Institute of Architects for her work as a writer and historian. The book can be ordered online from UC Press.